The academic study of western esotericism is one of those new developments in the study of religions which may strike the casual observer as having appeared almost overnight, due to the fact that its gradual development over the past decades is easily overlooked. Like any newcomer, the discipline tends to evoke curiosity as well as suspicion; and such reactions are all the more natural because the very term "esotericism" (like the related term "occultism") is a particularly loaded one. In this article, I intend to provide a brief introduction to the current state of "the study of esotericism"; and to give special attention to why it is important for students in this field - even those whose approach is strictly historical/descriptive - to consider issues of a methodological and theoretical nature. What is understood by "Western Esotericism"? 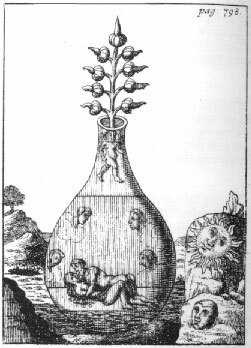 The first illustration from Spiegel der Philosophen, a famous series of alchemical images. For the full series, click here. between initiates and non-initiates.Third: Within the discourse of the "perennialist" or "Traditionalist" school of religious studies, the esoteric is a metaphysical concept referring to the "transcendent unity" of exoteric religions. Fourth: In "religionist" approaches to religious studies, esotericism tends to be used as a near synonym of gnosis in the universalizing sense of the word (i.e., covering various religious phenomena which emphasize experiential rather than rational and dogmatic modes of knowing, and which favour mythical/symbolic over discursive forms of expression). Fifth: From a strictly historical perspective, western esotericism is used as a container concept encompassing a complex of interrelated currents and traditions from the early modern period up to the present day, the historical origin and foundation of which lies in the syncretistic phenomenon of Renaissance "hermeticism" (in the broad and inclusive sense of the word). Western esotericism thus understood includes the so-called "occult philosophy" of the Renaissance and its later developments; Alchemy, Paracelsianism and Rosicrucianism; Christian and post-Christian Kabbalah; Theosophical and Illuminist currents; and various occultist and related developments during the 19th and 20th century. The academic study of western esotericism we are discussing here is based upon the fifth and final meaning: it investigates a series of specific interrelated historical currents in modern and contemporary western culture, which have largely been neglected or disregarded by earlier generations. However, the relationship of the discipline to approaches linked to the four other meanings of esotericism is a complicated one. esotericism among academics no less than laymen: again and again, scholars of western esotericism are forced to explain that the study of popular New Age spiritualities concerns no more than a small subarea of their domain, and that those who wish to study subjects such as the paranormal or altered states of consciousness should turn to other disciplines (such as parapsychology or transpersonal psychology). 2. As for the association of "esoteric" with secrecy and concealment, it is important to point out that, although there is obviously a significant area of overlap between the study of secrecy in religious traditions and the study of western esotericism in the historical sense of the word, these two domains of study are by no means equivalent. Secret traditions and initiations are not restricted to western esoteric traditions; and, reversely, many aspects of the latter have never been secret and are not linked to initiatory organizations. The relation between the two domains is in fact a quite subtle one, partly because the meanings and connotations of "secrecy" within western esoteric traditions are much more diverse than is usually realized. 3. The relationship between the study of western esotericism and the type of "comparative religion" known as perennialism or traditionalism is problematic for practical and organizational rather than scholarly reasons. The frequent assumption that the two share a common domain of interest is mistaken: there is hardly any demonstrable connection between the perennialist concept of esotericism as the metaphysical point of unity where exoteric religions are believe to converge, and the historical concept of western esotericism as a specific series of currents in modern and contemporary western culture. Perennialism is a mode of interpreting - not esotericism, but the phenomenon of religion as such; and whereas perennialist literature shows a marked preference for such religions as Hinduism and Islam, historical currents typical of western esotericism play a marginal role in it. This is the second image in the series Spiegel der Philosophen. For the full series, click here. Nevertheless, due largely to the existing lack of clarity about the meaning(s) of the term esotericism, scholars of western esoteric currents frequently find themselves scheduled in seminar programs or publication series together with perennialists. Experience shows that such artificial marriages do not last. 4. The relation of the historical study of western esotericism to "religionist" approaches of esotericism is probably the most problematic of all, and needs to be discussed at somewhat greater length. It roughly reflects a division within the study of religion generally, between those for whom the study of religion means the empirico-historical and comparative study of specific historical religions, and those for whom it means the study of a domain frequently referred to as "the sacred." Scholars belonging to the latter category tend to be motivated by a latent or explicit dissatisfaction with contemporary western culture, and particularly with patterns of desacralization and "the disenchantment of the world." To them, studying the sacred means calling attention to a vital and important dimension of reality which they feel is being threatened by onesided rationalization, secularization, and the mechanization of the world. Now, certain scholars of this persuasion present the sacred in western culture as closely associated, if not synonymous, with its "esoteric" dimension; and as we saw, they perceive the latter as characterized by experiential rather than rational and dogmatic modes of knowing, and mythical/symbolic rather than discursive modes of expression.] By calling attention to "esotericism" in this sense of the word they hope to contribute to a "new Renaissance" under the sign of a "reenchantment of the world". is meant by "western esotericism". When they refer to their domain of study by the term "esotericism" they do not mean some kind of universal and trans-historical sui generis phenomenon (analogous to "the sacred" in religious studies), but a certain number of historical currents and traditions in western culture that are available for study regardless of how they are evaluated. As a domain of inquiry, western esotericism in this historical sense of the word lies wide open to scholars of all persuasions: they may or may not happen to believe in the existence of "the sacred", they may personally regard specific esoteric beliefs as profound truths or as interesting superstitions, or they may simply see no reason to express opinions pro or contra. The primary problem in the relation between the historical study of western esotericism and "religionist" approaches to esotericism therefore has to do with different ways of defining and demarcating the field of inquiry, rather than with the methodologies used in studying that field. This point is frequently misunderstood and needs to be strongly emphasized. Understanding "western esotericism" in a historical sense (i.e., according to the fifth meaning discussed above) imposes clear limits upon the range of historical phenomena which are understood as falling within the purview of the field; but it does not imply by any means that only one particular method is considered valid in studying them. There is ample room for various approaches to complement each other as well as compete with each other in a constructive manner, within a general context of methodological pluralism. I would suggest that two dimensions may be distinguished in the current emergence of the academic study of western esotericism: the first one may be called "organizational", the second one "constructive". long time; but scholars in the field have either been working in relative isolation, or have done their research in the context of another discipline than "western esotericism". For example, one may find historians of medicine specializing in Paracelsian traditions, art historians specializing in the occultist backgrounds of modern painting, and so on. Such scholars are de facto working, among other things, in the field of western esotericism; but in practice most of their professional contacts (including participation in conferences or publication series) are likely to be with their colleagues in the history of medicine or art history rather than with fellow specialists of western esoteric currents. The first, "organizational" aspect of the emerging study of western esotericism consists in creating institutional frameworks for bringing such scholars into contact with each other and stimulate constructive exchange between them; this results in "making visible" the remarkably large amount of research that is already being done in a wide variety of academic settings, and making the results more readily available across disciplines. Organizational frameworks may take the form of interdisciplinary conferences, professional academic journals, monograph series, and so on. Various initiatives in these directions are currently being developed, based upon the creation of a international network of scholars combined with a computerized database which keeps track of new research. esotericism" as the label for new institutional frameworks, one may find that some excellent specialists hesitate or flatly refuse to participate, simply because being associated with "esotericism" may cause them to lose academic credibility. I see only two ways of dealing with this unfortunate problem. One might choose to avoid the term "esotericism", and opt for neutral and non-offensive but inevitably somewhat clumsy descriptions (for example, "hermetic and related currents in modern and contemporary western history"). Or, alternatively, one may hope that continued usage of the word "esotericism" in serious academic discussion will eventually cause it to shed its questionable associations and become broadly accepted as a neutral term. Obviously, this article is based upon a choice for the second option. theoretical dimension proper to the field of western esotericism as such. Let me emphasize that the development of such projects is not by any means incompatible with precise historical and philological study of primary sources, based strictly upon the ad fontes principle. Not a few specialists working on specific historical currents or personalities feel no need at all for interpretive theories, but prefer to "let the sources speak for themselves" as much as possible. In my opinion, such predominantly descriptive historical research based upon solid text editions is and remains the indispensable foundation of any serious study of religious traditions, including western esoteric ones, and no research of a comparative or systematic nature would be conceivable without it. My point here is merely that in order for the study of western esotericism to develop into a genuine academic discipline, this type of research must not be the only one; questions of a comparative and systematic nature deserve serious attention (at least by part of the scholars) in addition to the basic groundwork of historical and philological research. This is the third image in the series Spiegel der Philosophen. For the full series of alchemical illustrations, click here. phenomenon of grand spectacular theories which, at closer examination, appear to lack any basis in historical fact. The former is a case of high quality at the expense of relevance; the latter a case of (seeming) "relevance" at the expense of quality. Undoubtedly the former type is to be much preferred over the latter, for it does produce real and lasting contributions to scholarly knowledge which may be picked up and put to further use by others; the latter, in contrast, merely produces errors and confusion. Nevertheless, the ideal should obviously be a combination of what is best in both: research of the highest possible quality, which is not only based upon solid and precise historical research but also speaks to issues of more general interest in a way such as to make its relevance evident to the reader. The realization that there may in fact be a relevance to the study of western esotericism has recently been gaining ground in academic circles. The very idea of studying esotericism seriously and from a neutral perspective would have sounded bizarre and potentially dangerous to most academics no more than a few decades ago,] and such reactions are still not uncommon today. It has become more and more apparent, however, that the traditional neglect of western esotericism as a domain of historical inquiry has led to serious gaps in our knowledge, with predictably negative effects upon the understanding of our own cultural heritage. The same point may obviously be formulated in a positive manner as well: it has become clear that serious research into western esoteric currents may often throw a fresh new light on old questions, and may occasionally turn out to be the "missing link" which makes a solution possible at last. This is the fourth image in the series Spiegel der Philosophen. For the full series of alchemical illustrations, click here. however, which I feel is very much a mixed blessing for the future development of the discipline. A broadly "postmodern" Zeitgeist, instinctively critical of the "grand narratives" of modernity and therefore sympathetic towards the recovery of "suppressed alterities" is most certainly another. But although the study of western esotericism is now indeed in the process of coming into its own, the discipline still has a long way to go. As I have argued elsewhere, its emancipation will be accomplished when the study of western esotericism no longer represents something resembling an academic "counter 'Counterculture'-culture" but will have been assimilated as a normal part of the academic mainstream. The necessary conditions for such a development are now in existence; but to use the opportunities to their fullest potential is a task awaiting contemporary as well as future generations of researchers. This article will be published in Theosophical History in spring, 1999. 1 On the history of the discipline: Antoine Faivre & Karen-Claire Voss, "Western Esotericism and the Science of Religions," Numen 42 (1995), 48-77; Wouter J. Hanegraaff, "Introduction: The Birth of a Discipline," in: Antoine Faivre & Wouter J. Hanegraaff, eds., Western Esotericism and the Science of Religion: Selected Papers presented at the 17th Congress of the International Association for the History of Religions, Mexico City 1995 (Gnostica: Texts & Interpretations 2), (Peeters: Louvain, 1998). 2 Cf. Antoine Faivre, "Questions of Terminology proper to the Study of Esoteric Currents in Modern and Contemporary Europe," in Faivre & Hanegraaff, Western Esotericism and the Science of Religion. Whereas Faivre distinguishes four meanings, I propose to split up his third one. New Age Religion and Western Culture: Esotericism in the Mirror of Secular Thought, (Leiden: 1996/Albany: 1998), 385-388. 4 Antoine Faivre, "The Notions of Concealment and Secrecy in Modern Esoteric Currents since the Renaissance (A Methodological Approach)," paper read at the conference Rending the Veil: Concealment and Secrecy in Religions, New York University, April, 1997; see Antoine Faivre, ''The Notions of Concealment and Secrecy in Modern Esoteric Currents since the Renaissance (A Methodological Approach)," in: Elliott R. Wolfson (ed. ), Rending the Veil: Concealment and Secrecy in the History of Religions, Seven Bridges Press: New York & London 1999, pp. 155-176. 5 See for example Frithjof Schuon, The Transcendent Unity of Religions, revised edition (Wheaton/Madras/London: 1984); and William W. Quinn, The Only Tradition, (Albany: 1997). Cf. the discussion in Wouter J. Hanegraaff, "Empirical Method in the Study of Esotericism," Method & Theory in the Study of Religion 7:2 (1995), 110; and id., "On the Construction of 'Esoteric Traditions'" in: Faivre & Hanegraaff, Western Esotericism and the Science of Religions, 26-28. 6 See the examples of Gilles Quispel and Pierre A. Riffard, discussed in Hanegraaff, "On the Construction," pars. 3.1.1. and 3.1.2. In the United States, this fourth type is linked in particular to approaches influenced by Mircea Eliade and Carl Gustav Jung. 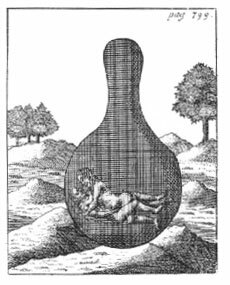 7 The best introduction and overview of western esotericism in this sense of the word is Antoine Faivre, Access to Western Esotericism, (Albany: 1994). 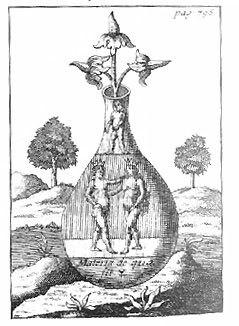 As an innovative syncretism of various older traditions, the origins of Renaissance "hermeticism" reach back to antiquity. See for the continuities between ancient, medieval and modern traditions: Antoine Faivre, "Ancient and Medieval Sources of Modern Esoteric Movements," in: Antoine Faivre & Jacob Needleman (eds. ), Modern Esoteric Spirituality, (New York: 1992); and the collective volume by Roelof van den Broek & Wouter J. Hanegraaff (eds. ), Gnosis and Hermeticism from Antiquity to Modern Times, (Albany: 1998). parallel phenomena in Jewish and Islamic culture, so that "western esotericism" might be perceived as a broad domain of study common to the Religions of the Book (Hanegraaff, 'Empirical Method', 121-124). Such an extended usage would constitute a further, sixth meaning of "esotericism". 9 See my observations on this point, in Wouter J. Hanegraaff, "The New Age Movement and the Esoteric Tradition," in: Van den Broek & Hanegraaff, Gnosis and Hermeticism, 359-361. 10 Obviously I do not intend to suggest that scholars of western esotericism cannot, in certain cases at least, make use of the results of such disciplines in interpreting esoteric currents. See for example the work of Dan Merkur, Gnosis: An Esoteric Traditions of Mystical Visions and Unions, (Albany: 1993). 11 For a discussion of these various meanings, see Faivre, "The Notions of Concealment and Secrecy." 12 Obviously I do not mean to deny that the "concordance" of different traditions (in the form of discourses on a philosophia perennis or prisca theologia) has been a major concern in many historical forms of western esotericism, nor that some of the latter have had an influence on certain important perennialist authors. These points of contact between the two meanings of esotericism would constitute a highly interesting subject of investigation. My point is merely that perennialist authors study (what they consider to be) metaphysical Truth, whereas students of western esotericism study a certain number of historical currents (regardless of whether their teachings are considered true or false). Frithjof Schuon almost completely neglects western esoteric currents in the historical sense (cf. S.H. Nasr, ed,, The Essential Writings of Frithjof Schuon, (Shaftesbury & Rockport: 1986), 19-20, 233-261). 14 Here and in what follows I am never referring to the sacred in the Durkheimian sense of the word (on the difference, see W.E. Paden, "Before 'The Sacred' became Theological: Rereading the Durkheimian Legacy: Method & Theory in the Study of Religion 3:1 (1991); cf. the discussions of Durkheim and Eliade in Hanegraaff, "Defining Religion"). 15 On this point, see Wouter J. Hanegraaff, "Defining Religion in Spite of History," in: Jan G. Platvoet & Arie L. Molendijk (eds. ), The Definition of Religion: Concepts, Contexts & Conflicts, Royal (Leiden: Brill, 1998). 16 An excellent example is the French scholar Pierre A. Riffard. See esp. his L'ésotérisme, (Paris: 1990). 17 For example, no less than three thoroughly historical articles in Faivre & Hanegraaff, Western Esotericism and the Science of Religion significantly end with expressing hopes for cultural renewal: Arthur Versluis, "Alchemy and Christian Theosophic Literature," 141-144; Jane Williams-Hogan, "The Place of Emanuel Swedenborg in Modern Western Esotericism," 250; Garry W. Trompf, "Macrohistory in Blavatsky, Steiner and Guénon," 294. 18 Contra Karen-Claire Voss, "The University as a Space of Possibility," Rencontres transdisciplinaires 12 (1998), 100-101. This article is a particularly clear example of the misunderstanding referred to here. Defending the merits of an empirico-historical methodology against "religionist" methodologies (see my "Empirical Method" and "On the Construction") must not be confused with dogmatic attempts to impose such a methodology as the only scholarly valid one. innovative section on western esotericism organized in the context of the five-yearly congresses of the International Association for the History of Religions (IAHR); the first edition was organized at the 17th IAHR congress (Mexico City 1995; see the proceedings: Faivre & Hanegraaff, Western Esotericism and the Science of Religion) and will be continued at the 18th congress (Durban, South Africa, 2000). A new monograph series called Gnostica, concentrating on text editions, has been started by Garry W. Trompf, the late John Cooper, and Wouter J. Hanegraaff (publ. : Louvain: Peeters). A trilingual journal ARIES has circulated on a limited scale since 1985; preparations for a new formula and format, to be published by a major academic publisher, are now in an advanced stage. 20 Some recent examples: contemporary literary theory applied to the study of kabbala (Andreas Kilcher, Die Sprachtheorie der Kabbala als ästhetisches Paradigma: Die Konstruktion einer ästhetischen Kabbala seit der frühen Neuzeit, (Stuttgart & Weimar: 1998)); Michel Foucault's archéologie du savoir applied to Renaissance magic (Gary Tomlinson, Music in Renaissance Magic: Toward a Historiography of Others, (Chicago & London: 1993)); psychoanalysis and altered states of consciousness-research applied to various traditions of western esotericism (Merkur, Gnosis, op.cit. ); anthropological theories of "magic" applied to ritual magic in contemporary occultism (T.M. Luhrmann, Persuasions of the Witch's Craft: Ritual Magic in Contemporary England, (Cambridge Mass. : 1989)). "mysticism", a discipline from which the study of western esotericism has much to learn. See Moshe Idel's plea for what he refers to as a "phenomenological" approach as an alternative to Gershom Scholem's "philological-historical" one (Kabbalah: New Perspectives, (New Haven & London: 1988), esp. ch. 2), and Joseph Dan's "contingental" approach ('In Quest of a Historical Definition of Mysticism: The Contingental Approach', Studies in Spirituality 3 (1993), 58-90); and cf. my discussion of Scholem and Dan in "On the Construction," par. 3.3.2. Antoine Faivre's much-quoted definition of western esotericism in terms of four intrinsic and two extrinsic characteristics (Access, 10-14) has far-reaching implications for the conception of the discipline; I have myself used it, in slightly modified form, for developing a general and non-essentialist theory pertaining to the specific problem of the secularization of western esotericism (New Age Religion, Part III). These are only a few examples. 22 On the inevitable tension (but, in my opinion, a creative one) between the systematic and the historical dimension of the study of religions, see my observation in "Defining Religion," Introduction. 23 In the case of contemporary currents this may obviously be combined with sociological and anthropological research techniques (participant research etc.). indebted to Yates, even if her work is now criticized on many points. 25 The former type refers to a phenomenon so well-known as to need no further illustration; one characteristic example of the latter type would be Eric Voegelin's theory of "modern gnosticism" (cf. Hanegraaff, "On the Construction," par. 3.2.1.). 26 See the pertinent remarks made as early as 1976 by Paul Oskar Kristeller, who admits that in 1953 he had still felt somewhat embarrassed at having to report two cases of exorcism described by Marsilio Ficino: '... grâce à l'oeuvre de Thorndike, de Miss Yates et d'autres, nous ne sommes plus épouvantés quand nous rencontrons des idées scientifiques bizarres ou des conceptions astrologiques, alchimiques ou magiques chez les penseurs des siècles passés. Si nous découvrons des idées de ce genre dans l'oeuvre de Ficin, nous ne lui en faisons pas le reproche, mais nous le plaçons simplement dans une vaste tradition intellectuelle qui avait été négligée et évitée trop longtemps par les historiens, et qui est représentée par une littérature étendue et difficile qui a encore besoin ... d'un grand effort d'étude et d'exploration' ('L'état présent des études sur Marsile Ficin', in: Platon et Aristote à la Renaissance, (Paris: 1976), 63). 27 On this change with respect to the Renaissance, see Kristeller as quoted in note 26; cf. also Brian Copenhaver, "Hermes Trismegistus, Proclus, and the Question of a Philosophy of Magic in the Renaissancem," in: Ingrid Merkel & Allen G. Debus, eds., Hermeticism and the Renaissance: Intellectual History and the Occult in Early Modern Europe, (Washington: 1988), 79. Although the "Yates thesis" (cf. note 24) is no longer accepted in its original strong form, Renaissance magic is now generally taken seriously as an important dimension in the development of the scientific revolution. To give an example from another historical period, see how the factor of western esotericism, and its "hermetic" component in particular, affects the interpretation of Romanticism (for an overview of the development in Anglo-Saxon research, see my "Romanticism and the Esoteric Connection," in Van den Broek & Hanegraaff, Gnosis and Hermeticism). 28 Cf. my observations with respect to the popularity of Frances Yates's oeuvre, beginning with her book on Giordano Bruno published in 1964 (Hanegraaff, "Introduction," ix-xv), and the need for the study of western esotericism to move beyond the "Yates paradigm." 29 Cf. 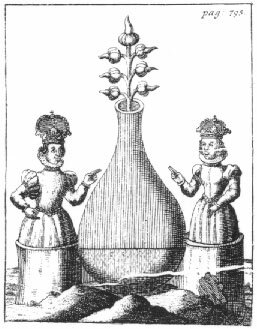 my review of Gary Tomlinson, Music in Renaissance Magic, forthcoming in ARIES 22 (1999).